"ECO Resource Group provided well-organized, stimulating training to all levels of the organization, resulting in palpable cultural change, while infusing fresh insights as we proceeded along the path." ECO provides customized training for businesses, government agencies, communities and non-profit groups in a variety of skills important to business sustainability, the success of government agencies, and the development of healthy communities. Our trainings recognize the adaptive nature of people and organizations and integrate the spirit of business and public service with the practical skills necessary to make a difference. Each training is built upon a complete curriculum that is customized to meet your specific needs. ECO facilitates retreats from a few hours in length to several days for councilors, commissions, boards, staff and communities. To increase your effectiveness, we assist you in clarifying your purpose and goals for the investment you are making. We will also develop supporting documentation, including an annotated agenda for your review, and design activities that will support you in being able to reach your retreat goals. ECO also offers interactive retreats that utilize the natural world as a basis for off-site team-building, leadership development, cultural diversity training, personal reflection and understanding the power of story to create innovation in your company. Integrating the ECO team’s diverse experience with training, coaching, ecotourism, sustainable travel, guiding, and nature-based education, our retreats are customized to meet your specific needs. The Corporate Renewal Retreat offers nature-based learning opportunities to for-profit and non-profit organizations. 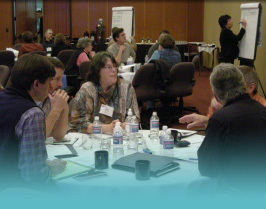 The retreat has its roots in organization development, systems theory and ecopsychology. Its goal is to create an opportunity for organizations to learn about themselves without many of the barriers that emerge in more traditional settings; thereby, creating a unique opportunity for improved communications, organizational learning and creative problem solving. This retreat is not a challenge course. However, it will require both corporate and self-reflection. Corporate Renewal will provide you with a new framework for understanding complex organizational issues, clarifying the problems within your organization that you know or sense exist, understanding the role of natural and cultural systems in your business, and developing a plan of action. It can also assist you in setting goals and developing priorities, solidifying a team, defining values, and improving communication strategies. You will also . . . Learn how to assess your organization’s ability to respond to change and readiness so you can evolve with the challenges you encounter. Evaluate the strengths of your organization and how effectively your organization communicates. Determine if there is common understanding of your organization’s vision and values, and how your organization responds to stress.